Today X 365 is one of four blogs I write, post photos to and attempt to manage! This is not the result of a Multiple Personality Disorder (one hopes) but rather because I love writing, taking photos and blogging. There are four subjects at the core of my life and each blog addresses one. Today X 365 speaks to my determination to write and take photos consistently…and then throw the results out here in the public domain thereby forcing me to improve my work until it is just short of brilliant. Today X 365 has served as an on-line journal and real-life taskmaster since April 3rd; now it will move to the next level of serious blogginess. The foci will be multiple (my attraction to the word multiple is a little worrying) and include my favorite everyday topics: Books and all related things; falling back in love with New Mexico after a period of disenchantment; other old media such as newspapers, television and film; and a day each week when I just talk about family or food or politics or age or anything else that comes to mind on my day off from being thoughtful. About Me, Marjorie Neset. The Basics: I am a woman…of a certain age (first post of this blog goes into more detail about that); a mother/grandmother/sister/cousin/friend, administrator, Democrat, Minnesotan New Mexican AND a reader, writer, traveler, amateur photographer and occasional foodie. 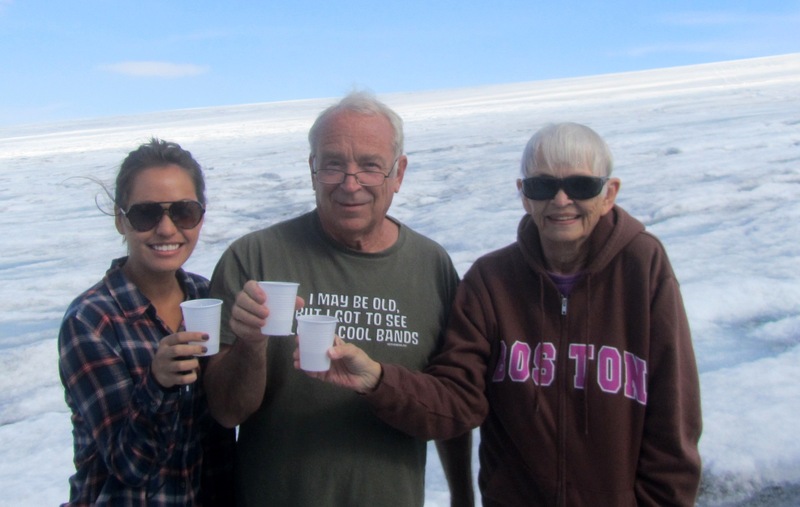 Teresa, Bob and Marj; Summer 2013; Iceland, out on the glacier–drinking glacial water.